Geno Crandall dribbles the ball during a game against Central Washington. Geno Crandall’s Gonzaga career will go down as one of the shortest in the program’s history, but his leadership on the defensive end will make it one that won’t soon be forgotten. The graduate transfer arrived on campus in October — his tardiness necessitated by NCAA requirements that he complete his undergraduate degree at North Dakota in order to be eligible to play for Gonzaga — and then missed nine games in November and December with a broken hand. But, the spark plug off the bench is making an outsized impact in his short time with the team. “He’s a natural leader,” junior forward Brandon Clarke says of his teammate. As a point guard, Crandall would be expected to lead the team and run the offense. It’s his leadership on the other end of the court though that has been most impactful. After back-to-back losses to Tennessee and North Carolina in December the Bulldogs have put renewed focus on the defensive end, and it’s working. In the 12 games since, all wins, Gonzaga is giving up an average of just 55 points per game. For the first four games of this run of defensive intensity, Crandall was still recovering from injury. It was winter break then, and the raucous student section was replaced with a more subdued group of fans. The Kennel was quieter than normal, but Crandall’s voice was audible throughout the building. 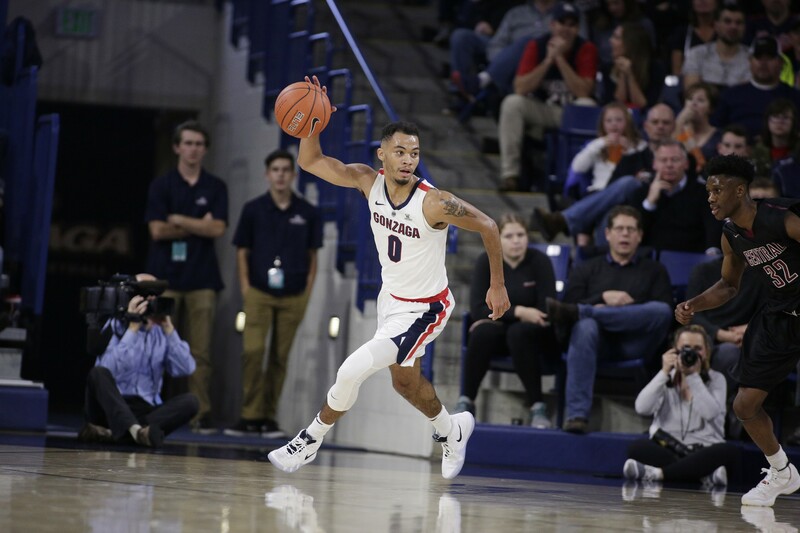 His broken hand kept him off the court, but it didn’t hinder his ability to clap and cheer as the Zags clamped down on defense. Since returning to the rotation on Jan. 5, Crandall’s enthusiasm and impact have been even more obvious. No Gonzaga player in recent memory has played with such ferocity, and enjoyment, on the defensive end as Crandall. Even when Gonzaga isn’t running the 1-2-2, three-quarter court press that the Zags have employed in spurts over the past month-plus, Crandall often picks up his defensive assignment in the backcourt anyway. This is a new role for Crandall, who spent the first three years of his career as a go-to scoring option for the North Dakota Fighting Hawks. In a game against Gonzaga in December 2017, Crandall scored 28 points and almost single-handedly led North Dakota to a massive upset victory — Gonzaga survived in overtime, 89-83. This season, he’s hit double-figures in scoring on just two occasions. On a team loaded with scoring threats, Crandall is no longer asked to carry the load offensively. In baseball, relief pitchers come in for the final innings to shut down opposing hitters and help their team close out a victory. The analogy is appropriate. Crandall’s defensive prowess has helped the Zags turn a corner, and they’ve been winning a lot of games on the defensive end. Gonzaga entered the season as a trendy Final Four pick. And, considering the old adage, “defense wins championships,” that seems even more reasonable now. If that does end up happening, it will be made even sweeter by the fact that Minneapolis isn’t just the site of this year’s Final Four, it’s also the hometown of Gonzaga’s defensive catalyst: Geno Crandall.